Help! is the fifth UK album and tenth US album by The Beatles, and the soundtrack album from their film of the same name. 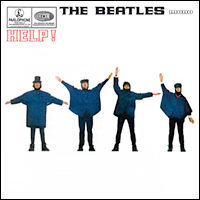 Produced by George Martin for EMI's Parlophone Records, the album (in its original British form) contains seven songs that appeared in the film Help! (including the singles "Help!" and "Ticket to Ride"), and seven that did not. The album features the Paul McCartney ballad "Yesterday". Tracks like Lennon's "You've Got to Hide Your Love Away" indicate the influence of Bob Dylan and folk music. Also tracks like "I've Just Seen a Face" the Beatles' sound truly matured into an eclecticism that started to reach beyond the bounds of what had previously been considered rock music. Several songs on 1964's Beatles for Sale, as well as "I'll Cry Instead" from A Hard Day's Night, had leaned in a country and western direction. But "I've Just Seen a Face" was almost pure country, taken at such a fast tempo that it might have been bluegrass if not for the absence of banjo and fiddle. In later years, Lennon said that the title track of the album was a sincere cry for help, as the pressures of the Beatles' fame and his own unhappiness (what he later called his "fat Elvis" period) began to build, and that he regretted turning it from a downbeat song in the style of Roy Orbison's "Only the Lonely" to an upbeat pop song as a result of commercial pressures. George Harrison contributed "I Need You" and "You Like Me Too Much". These were Harrison's first song compositions to be included on a The Beatles album since "Don't Bother Me", from 1963's With The Beatles.